I have a planter with several lettuce plants and other plants growing on my balcony. 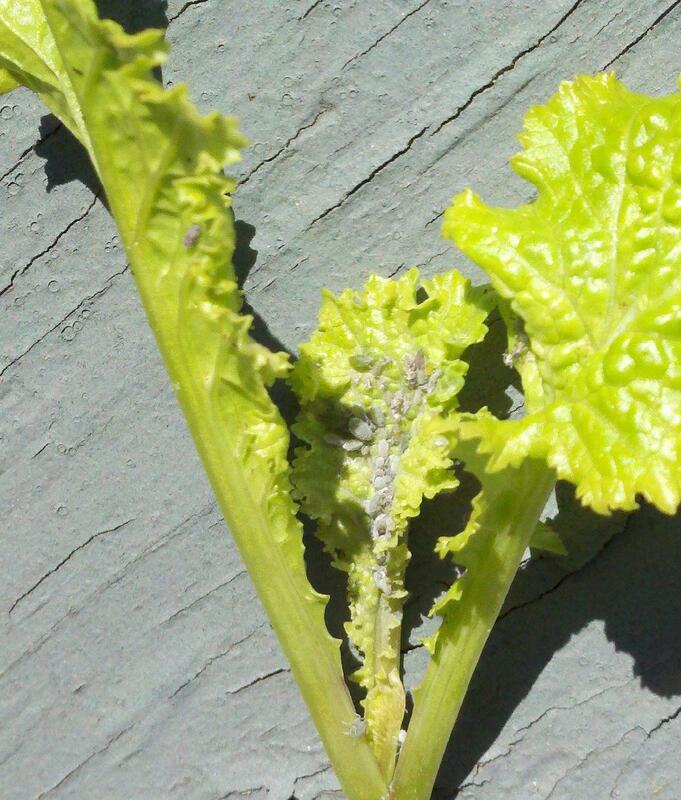 Recently, all of "normal" leafy lettuces were rapidly overcome by a bug. A sawtooth, more mizuna-like lettuce was spared, as were sage, parsley, onions, and basil. When I first saw this bug, I thought it was a fungus, because the bugs come so thickly clustered, and have this bulbous appearance to them like they are all outgrowths of the same fungus. Looking closer, I was able to see that some of them indeed have legs and move around, although some still look very much like unmoving lumps. In the picture I took for this post, they look entirely grey, but in person they definitely seem a little bluish. When I first noticed them, they had spread so quickly to coat these inner surfaces of the leaves, that I went with the scorched earth strategy. I cut each lettuce back to a stump, and now they are slowly starting to sprout small leaves again. To my dismay, the bugs have already returned to one lettuce. I'm looking for a more permanent solution now. Any ideas? Rinsing off the soap with a spray water bottle was less effective than I'd hoped, although not catastrophically so. It looks like some leaves sustained minor damage. Plants that weren't part of the treatment have some mottled yellow spots where (apparently) splashing from the soapwater spray hit them. For anybody at home trying this solution who also lacks a hose, I'd use a more dilute soap solution, or make sure to rinse the leaves with the spray bottle VERY enthusiastically. Pending further updates, I'll make @kevinsky's answer correct. Mealybug is my guess but they are usually warm season bugs and it's a bit early for them. They are sucking on the plant juices by clustering on the veins of the lettuce leaf. Or they could be aphids that are whitish. Aphids come in a lot of colours. Frankly it doesn't matter what they are, you need to control them. A good hose down followed by a spray of 1 tablespoon dish soap to one liter of water does the job. Given that lettuce is fairly delicate I would follow up on a spray with another hosedown after a few minutes to remove the soap. The fatty acids in soap can burn delicate leaf tissue if applied too strongly or left on too long. My best guess is whitefly (larvae), but it doesn't look quite right. If you see tiny bright-white flies around, that's it. Is your balcony enclosed? If so, can you open it? Whiteflies don't like cool weather, wind, rain, etc. Not the answer you're looking for? Browse other questions tagged identification pest-control pests lettuce or ask your own question. How do I identify and eradicate the pest that is destroying the plants in my flowerbox? What are these white bugs all over my lettuce? What are these black spots on white splotches appearing on my tomato seedling? What are the white bugs on my Aeonium and how do I get rid of them? What are these insects in my potted Schlumbergera? What are these tiny white bugs on my houseplants and succulents?